1145-1500-50 Diameter / Length: 1.5" / 50' Features: -Close woven nylon jacket impregnated withpolyvinyl chloride. -Mildew-resistant. -Rolls up flat for easystorage. -Warranty: Life of Product. -Blue in color. 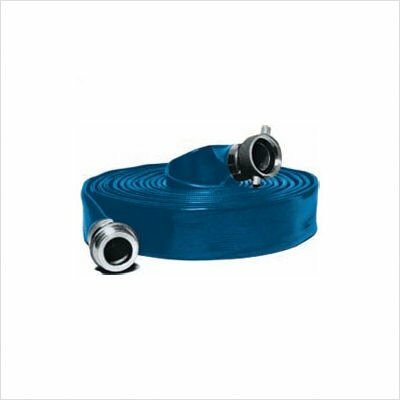 Product Type: -Discharge Hose. Country of Manufacture: -United States. Dimensions: Diameter / Length 1" / 25' - Overall Width - Side to Side: -1". Diameter / Length 1" / 25' - Overall Depth - Front to Back: -1". Diameter / Length 1.5" / 25' - Overall Width - Side to Side: -1.5". Diameter / Length 1.5" / 25' - Overall Depth - Front to Back: -1.5". Diameter / Length 2" / 50' - Overall Width - Side to Side: -2". Diameter / Length 2" / 50' - Overall Depth - Front to Back: -2". Diameter / Length 2.5" / 25' - Overall Height - Top to Bottom: -25". Diameter / Length 2.5" / 25' - Overall Width - Side to Side: -2.5". Diameter / Length 2.5" / 25' - Overall Depth - Front to Back: -2.5". Diameter / Length 4" / 50' - Overall Height - Top to Bottom: -50".